Occasionally Bond likes to dress entirely in black, sometimes for sneaking around at night or sometimes just casually, as he is here. 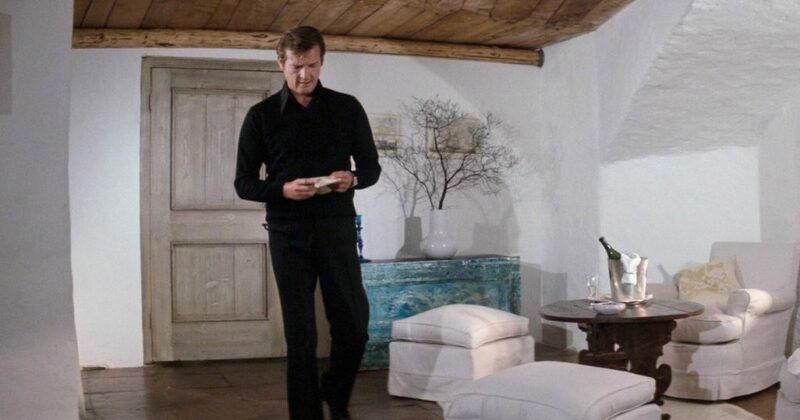 In The Spy Who Loved Me, Roger Moore wears all black when waiting around his hotel suite for a message. He wears a black V-neck jumper over a black silk shirt. The shirt has a two-button point collar and is likely not made by Moore’s usual shirtmaker Frank Foster. Bond’s flat front trousers are also black. Finishing off the outfit is a pair of black socks and black horse bit slip-ons from Ferragamo. 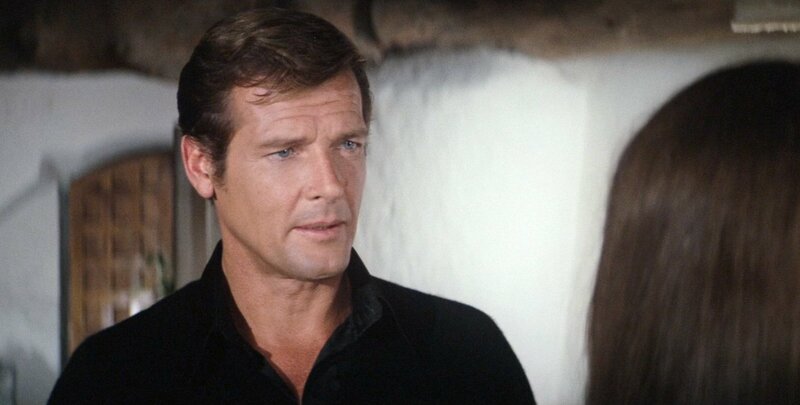 Black is not a particularly flattering colour for for Moore’s low-contrast, warm spring complexion, thus making him look a little washed out. 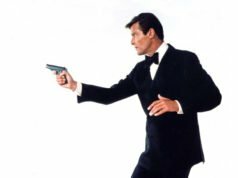 Will you be covering Bond's sneaking gear from Goldfinger in the future? You already covered the shoes from it I believe. I'll eventually get to everything! casual wear for this scene? Something more Mediterranean would have been more appropriate I would think. 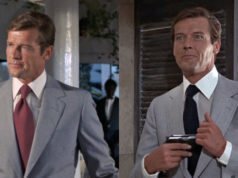 How would you have dressed Bond in this scene Matt? I really don’t know. I would have put him in some warm colours for this scene instead. Watching the film again I thought the outfit looked a little out of place. A medium blue jumper, pale blue shirt and navy slacks would have worked better for Moore and fit more with the location. Don’t wear them with a polo shirt if you don’t want to look like a golfer. But what’s wrong with looking like a golfer? Agreed. I think polo shirts can be a great casual look with v-neck sweaters. Long sleeve is even better for comfort and the ribbed sleeve hem won’t show through at the bicep. Any idea what the jumper is made out of?